We’re now to the point where not only do Eli Tomac’s struggles seem weird, but it also seems weird when he surges. His season has turned so unpredictable that no result makes complete sense. 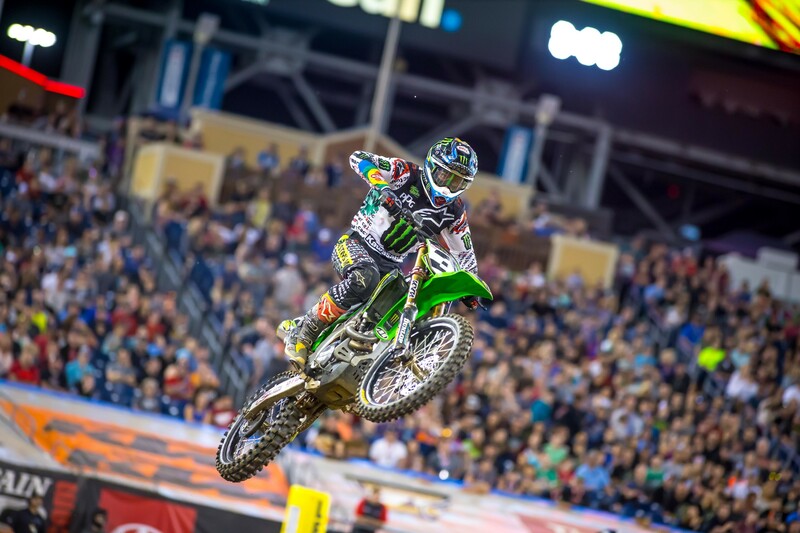 His wins in San Diego, Detroit and Daytona were followed by sub-par rides, and things were certainly not trending toward a win for the Monster Energy Kawasaki rider in Nashville. Practice and qualifying didn’t make it any better, as Tomac was 11th in the first session and sixth in the final one. Then he looked good briefly in his heat race until his bike broke, sending him to the LCQ. Yep, another nightmare night for Eli. Yup. He won. With the bad gate pick due to the LCQ he started around eighth. No one was even thinking of Tomac as a potential race winner at that point, as it was instead Ken Roczen who looked absolutely on fire as he made moves toward the front. 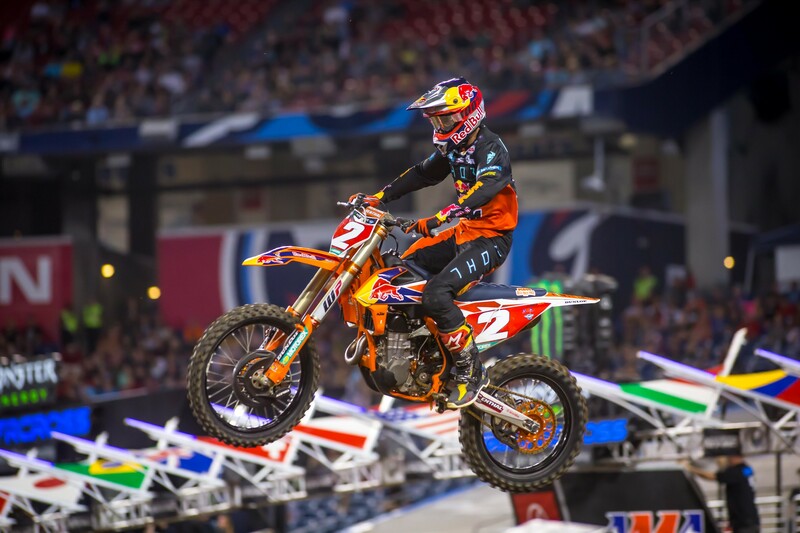 Roczen, though, is star crossed and seemingly cursed with his attempts to win a race. Joey Savatgy washed out, Roczen had nowhere to go and went down. His chances were over, and suddenly Tomac slid through the wreckage to find himself in third place. Plus, his old speed was back. He made quick work of Blake Baggett and Cooper Webb to take the lead and the win. Webb and Baggett were okay, but not as sharp as in other races this year. For one night, Tomac was back on top. At this point, Tomac would be foolish to proclaim his issues are instantly behind him, so he would only say, “there’s hope.” He did say this was by far the best he’s felt in a 20-minute plus 1 main event, and that counts for much more than his previous wins—a mudder in San Diego, a Triple Crown in Detroit, and Daytona, a totally different type of track. 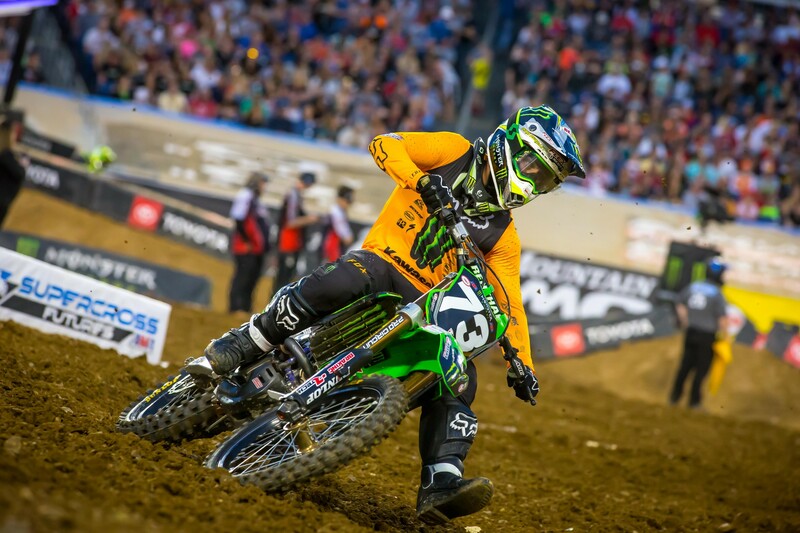 Tomac explained that his troubles are a combination of both the bike and him. Are they fixed? With this season, you can’t possibly know. In fact, there is only one constant in 2019, and it’s that everything will keep rolling Cooper Webb’s way. The Nashville track has two gnarly whoop sections, and whoops have been a problem for Cooper all season. Predictably, the Red Bull KTM rider struggled there, but predictably he also nailed the holeshot and rode smart to lock in another podium. 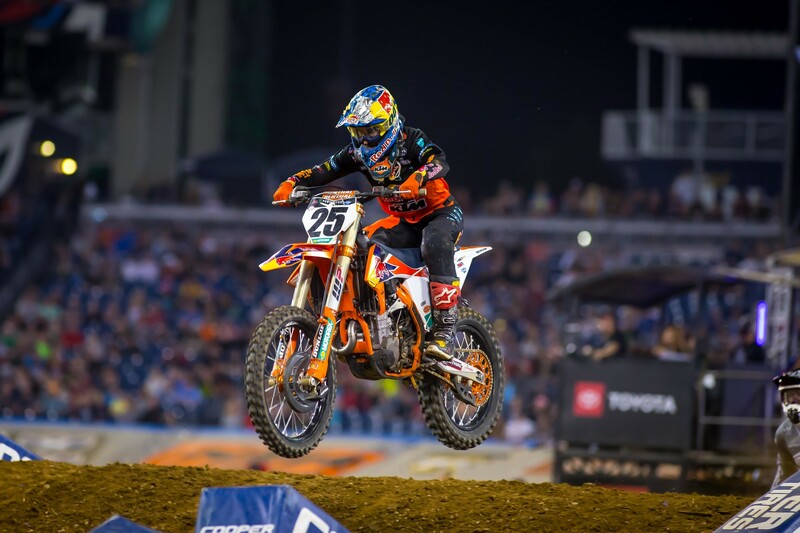 His teammate and title rival Marvin Musquin crashed in the whoops and finished sixth, so Webb has stretched his points lead to 21 over Musquin and Tomac. With his struggles in the whoops, third was okay. "When you’re out front, it was good, but I could tell they were catching me,” said Webb. “I was struggling with lines, whoops, this and that, [and I thought] hey, maybe I can learn, keep on their wheel and maybe I can attack later. It obviously didn’t work out like that. It was a track where it was slippery and you couldn’t be too aggressive. One of the guys better than him was Baggett, who finished second on his Rocky Mountain ATV/MC KTM. It’s his first podium since a second at Indy three weeks ago. 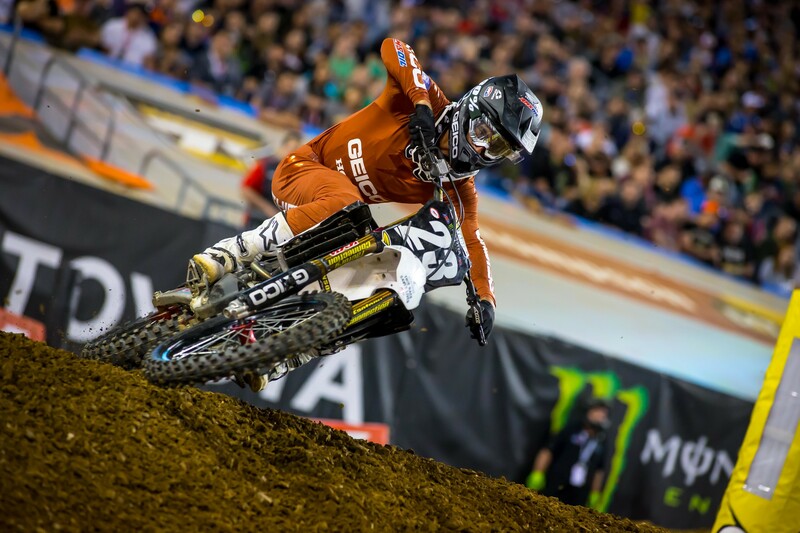 Another solid performance from Dean Wilson, who followed his podium in Houston with fourth. Wilson started up front, lost a little ground on the lead group, but then started closing back in on Webb to make a podium run toward the end. His Rockstar Energy Husqvarna teammate Zach Osborne was a solid fifth, just holding off Musquin, who logged a valiant charge from the back. 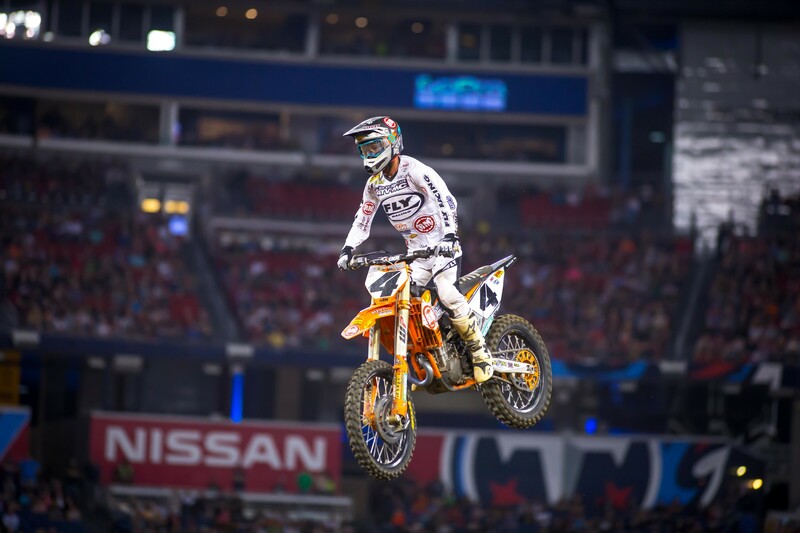 Mistakes have dotted Musquin’s attacks on Webb this year, and it happened again tonight. He snuck into second on lap one and saw a chance to make a move in the whoops, but instead he crashed and went to the back of the pack. 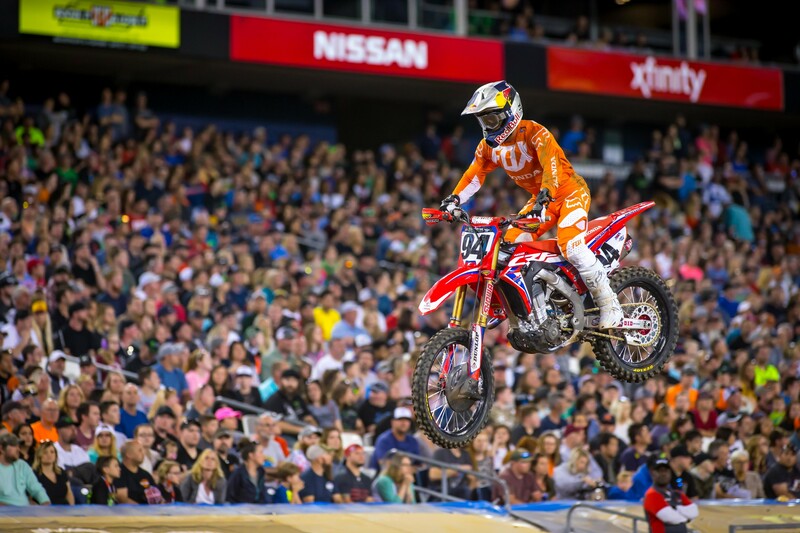 Honda HRC’s Cole Seely was seventh ahead of Roczen. Justin Bogle rode very well all day, including some hot practice lap times, and took ninth in the main. Tyler Bowers was also solid and took tenth. Savatgy's crash early in the main was costly, and he got up holding his arm. Our man Steve Matthes is reporting from the Monster Energy Kawasaki pits that Savatgy's shoulder popped out. We'll update his situation as we know more. All season long in the 250 class, Austin Forkner has walked the tight rope in qualifying. Multiple big crashes have somehow not resulted in any injuries, until today, when a wild ride through the whoops and into the tuff blocks resulted in an injured knee, which he then aggravated again in the final qualifying session. Forkner was on crutches in the Monster Energy/Pro Circuit Kawasaki pits by the time the night show began, telling us he couldn’t walk, so he definitely couldn’t ride. An MRI this week will reveal the extent of the damage, but for tonight the door was open for Chase Sexton and Justin Cooper to try to get a win and erase his points lead. So, opportunity knocked, and Justin Cooper kicked the door down. He ripped a good start from his preferred gate just outside the box, but Sexton was there to engage him in battle. Sexton sliced inside and nearly hit Cooper, but they avoided contact, and Cooper went for an ill-advised block pass to get him back. He ended up taking them both down. Cooper got up ahead of Sexton but then crashed again. They both recoved to come all the way through the pack and take second [Sexton] and third [Cooper]. Up front? A rejuvenated Martin Davalos. Marty has not had his usual speed this season, and he’s revealed that a lot of that goes back to lingering effects from last year’s neck injury. Fourth came Kyle Peters on the Yoshimura/JGR Suzuki. Peters says he saw the Cooper/Sexton crash and knew that was his chance to get a podium, but he probably pushed too hard early, locked up, and couldn’t maintain the pace. Fifth went to Brandon Hartranft on a Cycle Trader/Rock River Yamaha.